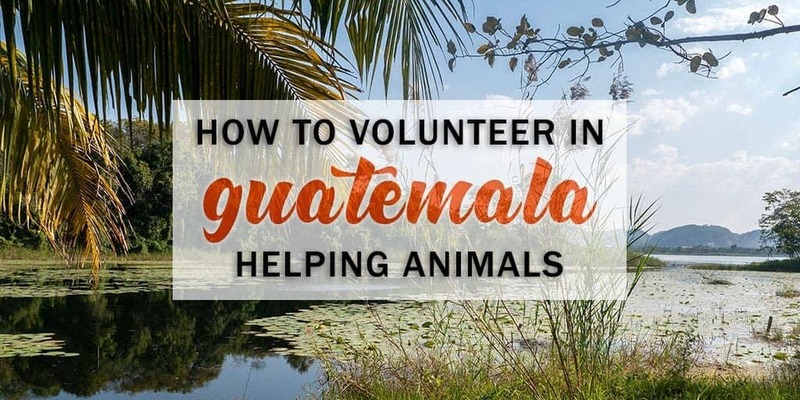 Here’s how you can travel and help animals in Guatemala. Nope, nope, nope. 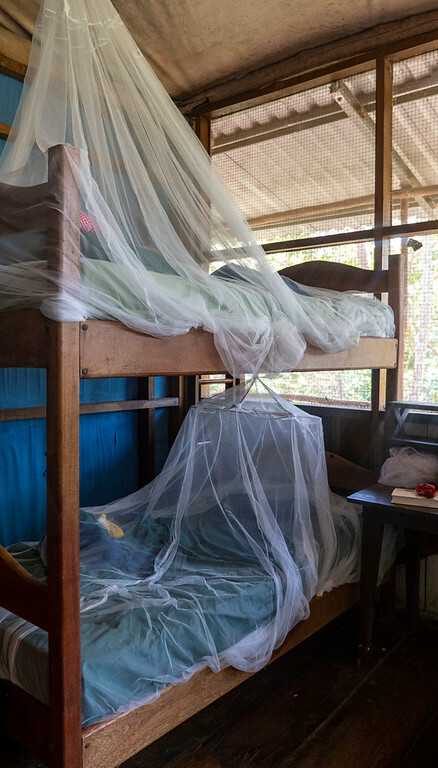 A tarantula…in the Guatemalan jungle? Of course there are tarantulas in the jungle. What else was out there, lurking in the shadows? In the darkness of night, we fumbled to our rooms with our luggage in tow. I managed to escape the wrath of the tarantula (who in reality, made an appearance, and quickly scurried off into the bushes). This time, I heard the rustling of leaves directly overhead. Were the spiders going to rain down from the skies? Phew, it was only a troop of spider monkeys. My initial anxiety transformed into excitement. Did you know that animal trafficking is the third largest illegal source of commerce worldwide? Wildlife trafficking, along with unsustainable forestation, over-hunting, and human population growth are the leading causes of species extinction. Illegal trafficking is primarily for the pet trade. Sadly, the survival rate of animal contraband is as low as 15%. Birds are the most commonly trafficked creatures; it’s estimated that two to five million birds are illegally traded worldwide each year. In Guatemala, there are massive wildlife conservation issues involving animal trafficking on the black market. Central America has 7% of the world’s biodiversity with a high rate of endemic species. In the world, it ranks as the 22nd most biodiverse hotspot. Animal trafficked from Latin America typically ends up in the North America, Europe, and Japan; however, many animals never leave their home country, winding up as pets or permanent fixtures at hotels and restaurants. 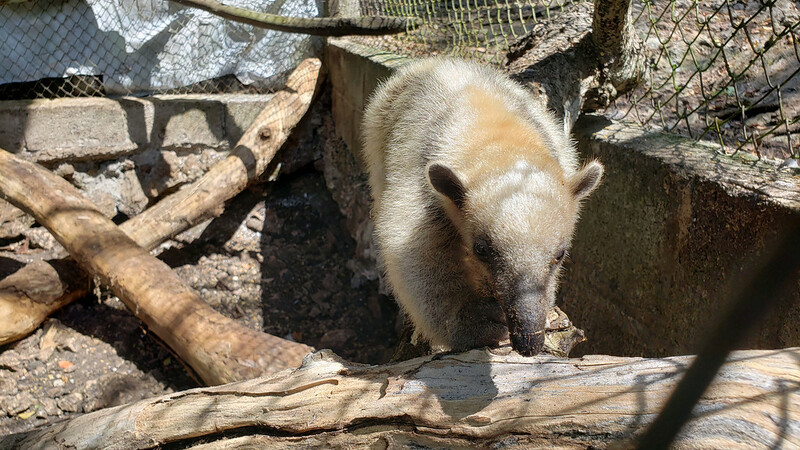 In 1989, a group of concerned Guatemalan citizens formed ARCAS, a non-profit Guatemalan NGO to rescue, care, rehabilitate, and release the victims of wildlife trafficking back into the wild. 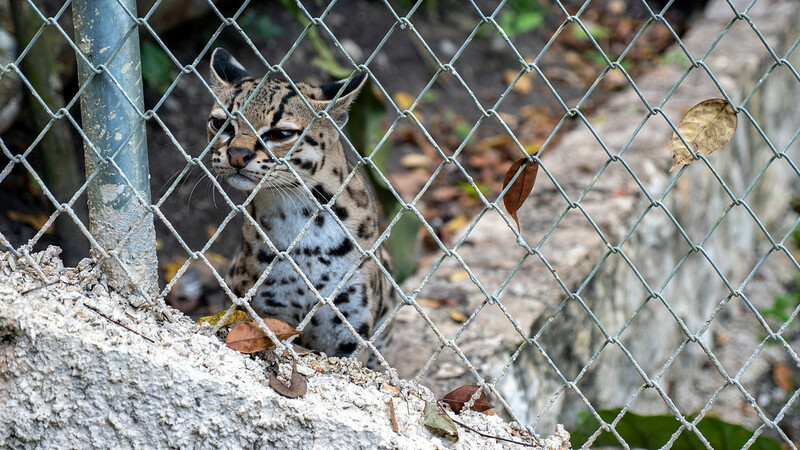 The Guatemalan government seizes anywhere between 300 and 600 animals a year, including more than 40 different species. 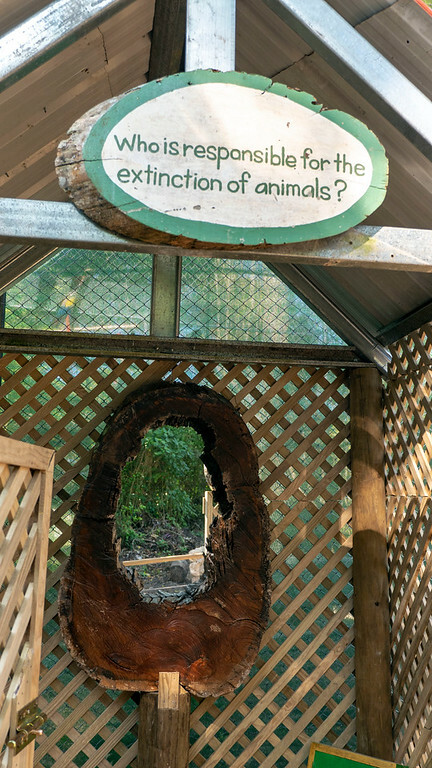 ARCAS established a rescue center for the animals that helps to improve their chances of survival. With great care, the employees, interns, and volunteers at ARCAS aim to rehabilitate and reintroduce animals back into their natural habitat. It’s one of the best and most important ways to help animals in Guatemala. It can take two to four years to rehabilitate a parrot and up to eight years to release a monkey into the wild. 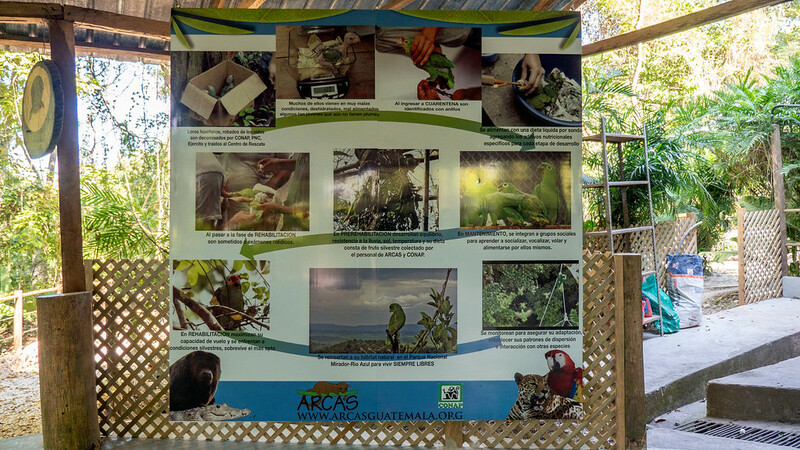 Another goal of ARCAS is to educate and create awareness about these conservation issues among Guatemalans and tourists alike. I truly admire this aspect of the wildlife rescue center because sharing information and education is half of the battle. That’s one reason why I take these kinds of trips and share this information on my blog: I want to share these valuable details as much as possible to help animals in Guatemala and around the world. 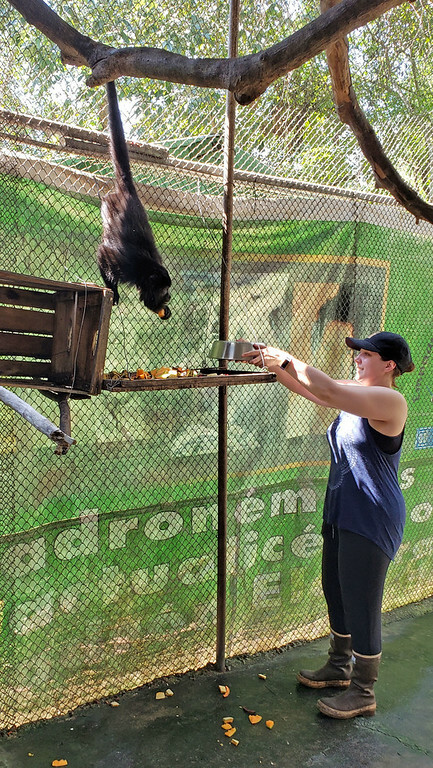 ARCAS has their main rescue center in Peten (where I volunteered), as well as a sea turtle conservation center in Hawaii (in Guatemala, not the US State), and an education and fundraising center in Guatemala City. 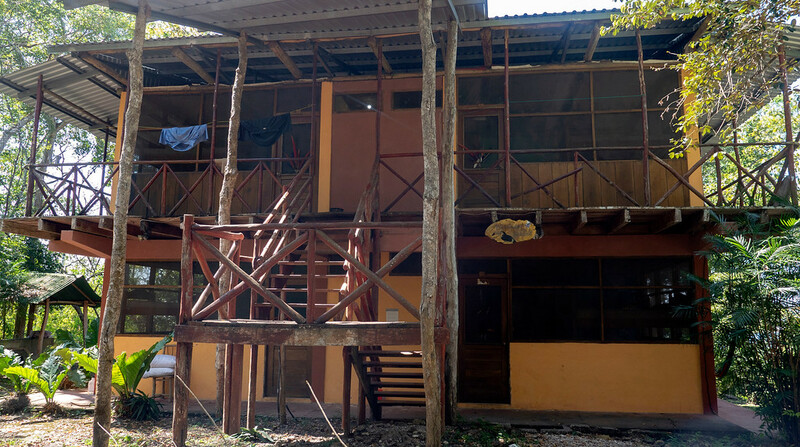 Beyond the wildlife rehab center at ARCAS Peten, there’s also an environmental education center called Kinkajou Kingdom. 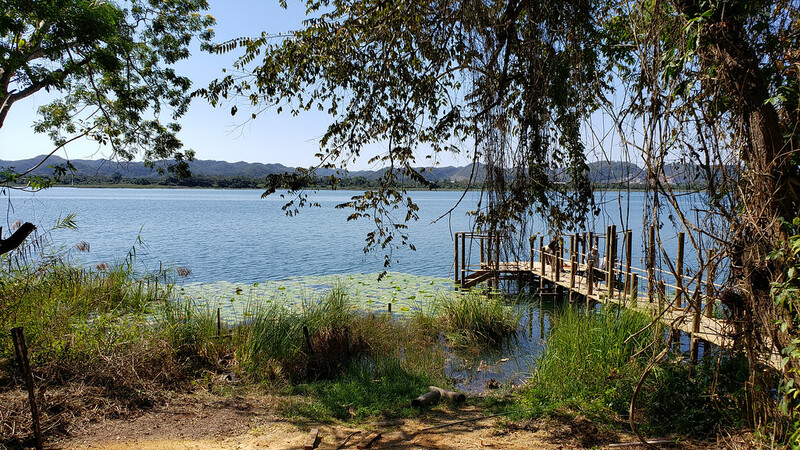 If you find yourself in Flores, Guatemala, you can take a water taxi across the way to ARCAS’ Kinkajou Kingdom for a guided tour. It’s a way for day trippers to experience the center and the positive work that ARCAS does for the environment. 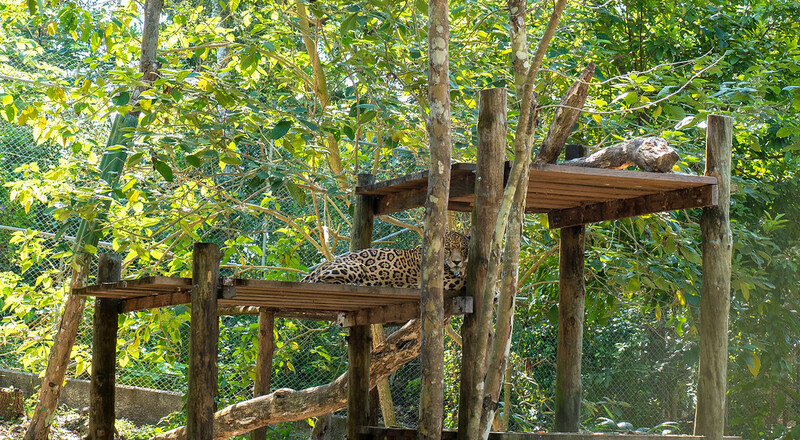 While visitors are not permitted to visit the rescue center for a variety of reasons, seeing the animals at Kinkajou Kingdom is a great way to be exposed to the rehabilitation activities that happen there. 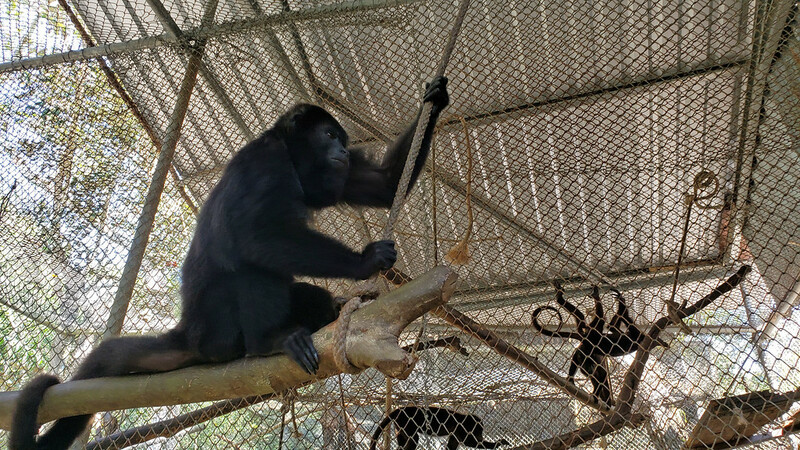 The animals that live at the education center cannot be released back into the wild for many reasons, which might include too much human interference or prior injuries. 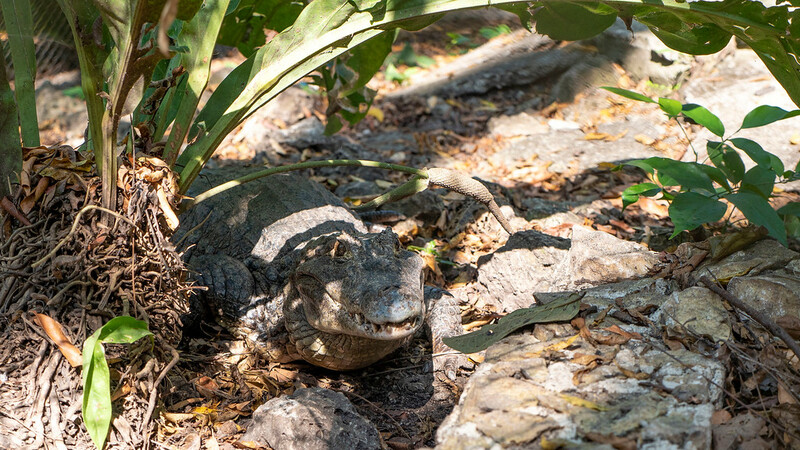 You’ll see lots of creatures like parrots, monkeys, crocodiles, jaguars, ocelots, and more. 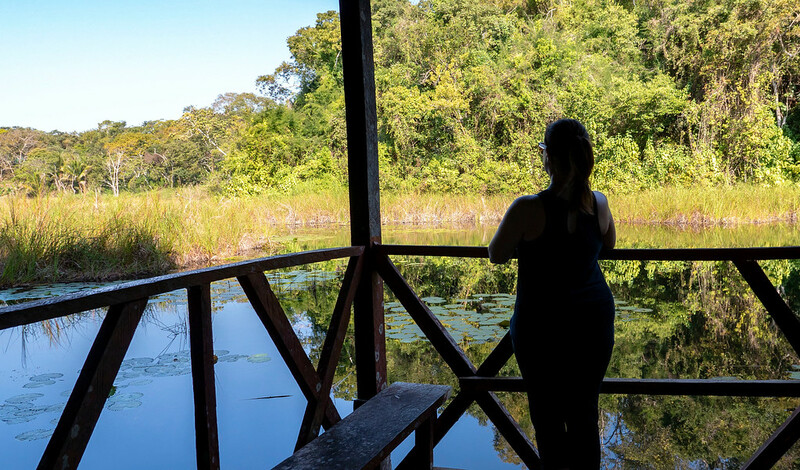 You’ll learn more about the flora and fauna of Guatemala in the middle of the jungle. You might recall that I volunteered with Animal Experience International in Kenya back in 2016. I’m a huge fan of the AEI small group expeditions that happen every year or so. 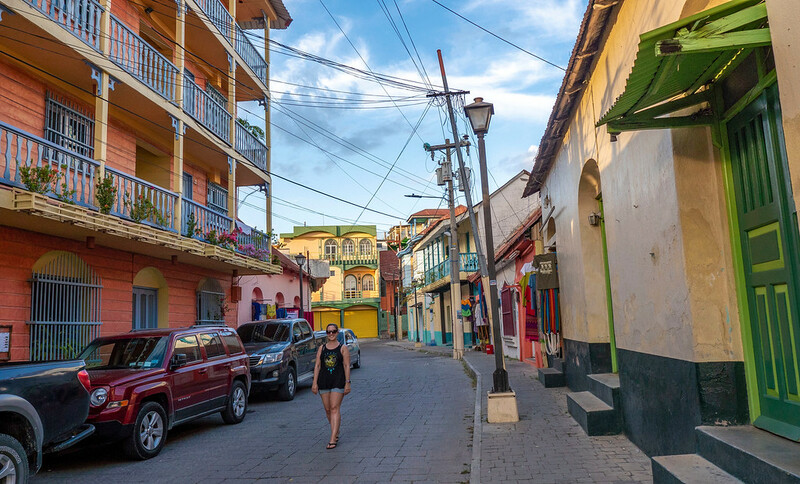 The entire experience is totally sorted out for you, so you don’t have to worry about accommodations, meals, finding your volunteer placement, or figuring out activities in the area. Nora, one of the two female CEOs of AEI, visits and volunteers at every center, so you can be certain that they all make a long lasting impact. Nora will help you figure out your flight and will assist you with any information that you require. All trips include airport transfers, a donation to the placement partner, premium individual travel insurance, and carbon credits to offset 3 tonnes of greenhouse gas emissions. This particular group expedition also included an overnight trip to Tikal National Park. During group expeditions, Nora will accompany the group on the trip, acting as our team leader. It’s always great to have an expert in the group to rely on for any extra assistance. Traveling with AEI absolutely puts me at ease; while I’m volunteering overseas in unfamiliar territory, I know that I’m in good hands. Now, if you’re not able to attend a group expedition, most volunteers with AEI travel on their own at a time that’s convenient to them. You can easily browse all of their experiences online, whether you’re looking to volunteer with animals in a specific area of the world or you want to help a certain kind of animal. Their placements are all safe, ethical, and fun! 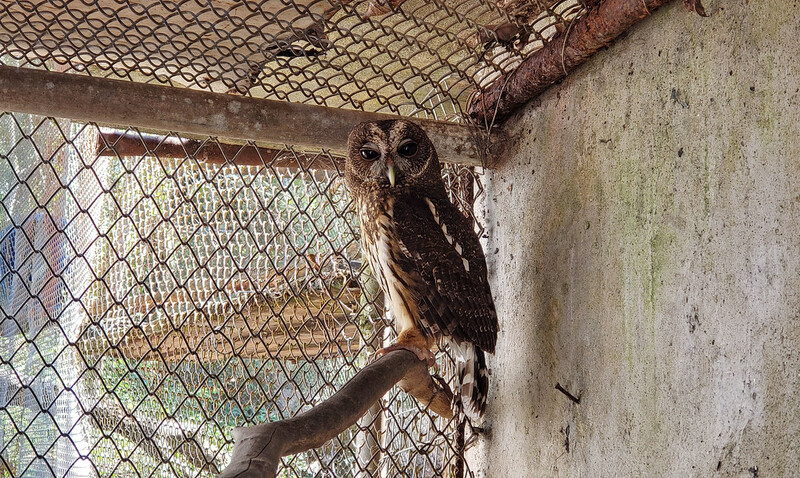 When you work at ARCAS Guatemala, you have an up close and first hand experience helping animals in Guatemala. 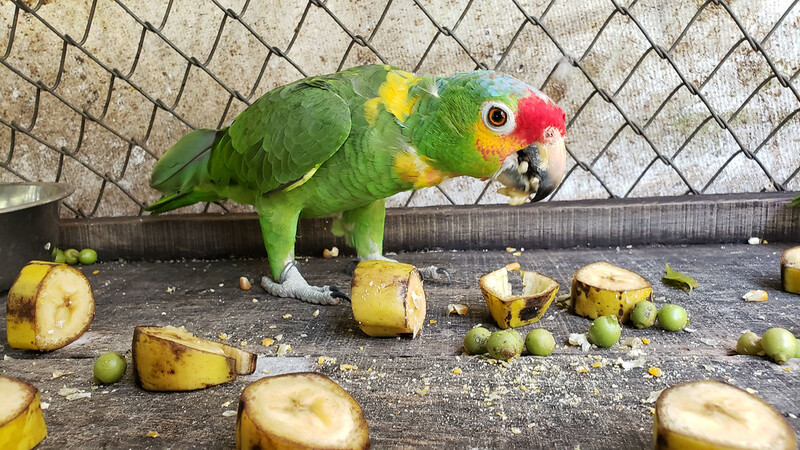 At the wildlife rescue center, you’ll see endangered and beautiful animals like howler monkeys, spider monkeys, parrots, macaws, crocodiles, turtles, woodpeckers, owls, hawks, anteaters, jaguars, coatamundis, peccaries (similar to pigs), deer, and the list goes on. 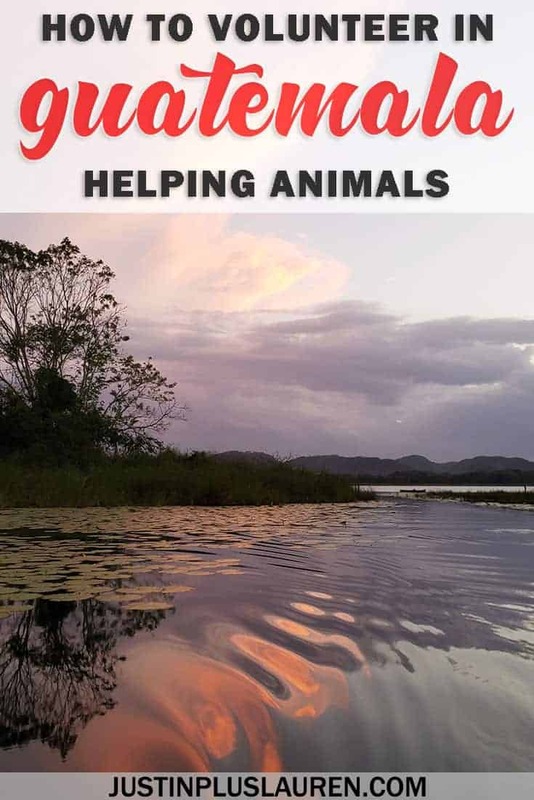 It is very important to realize that you’re there to help animals in Guatemala. At ARCAS Guatemala, the animals come first. In order to succeed in rehabilitating and releasing wild creatures back into their natural habitat, volunteers must adjust their own habits and attitudes. The biggest rule (which was more difficult than I expected) was that we weren’t allowed to talk to the animals. I’m so used to chatting away to my two cats at home and uttering things out loud to animals, such as a greeting or some sort or exclamation (“aren’t you cute!”). If people speak to the animals, the animals begin to trust people. Then, there’s no way that they could ever live in the wild. Similarly, macaws and parrots love to mimic humans. Once a parrot starts to mimic our languages and phrases, it can’t ever live in the wild. The primary goal is to help the animals become wild again, so we shouldn’t speak to the animals. Similarly, you can’t handle the animals or feed them directly from your hands. We also had to take great care when photographing the animals. I never brought my DSLR camera into the cages. First, I was there to volunteer and care for the animals in Guatemala, so there really wasn’t any time to take professional photos. You can take pictures with your phones, but at an appropriate distance (no selfies, please!). Now that we have the basic rules out of the way, let me tell you all about our daily responsibilities helping animals in Guatemala. We woke up each day at 5:45am. I know this seems really early, and I’m normally a night owl myself. However, I really got used to going to sleep around 9:00pm and waking up at this time. We woke up at the same time as many of the animals woke up. The howler monkeys would start to…well, howl, which sounds more like some sort of aggressive dinosaur growl more than anything (click here to hear what howler monkeys sound like). Yes, howler monkeys are one of the loudest creatures on earth, so there’s no chance you’ll sleep through their bellowing noises! The volunteers primarily cared for animals in the pre-rehabilitation and maintenance areas, although some animals in quarantine were helped. If you helped the animals in quarantine, you weren’t allowed to care for some other animals (and vice versa). In our case, we typically helped the same animals day after day, so we became quite familiar with their specific needs. I volunteered in the pre-rehab section with several parrots that had special needs. For instance, one of my parrots had an amputated foot, and another was missing one eye. I suspect that these birds will live the rest of their lives at the education center once they are well enough. Most of the pre-rehab birds lived in their own cages until they were well enough to be moved into larger structures with other birds. 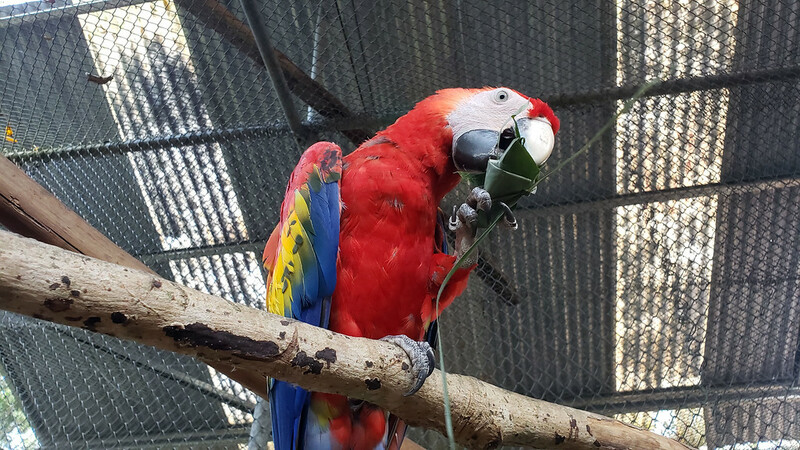 I also helped macaws and parrots that were slowly becoming better and could live with other birds at similar stages of wellness. 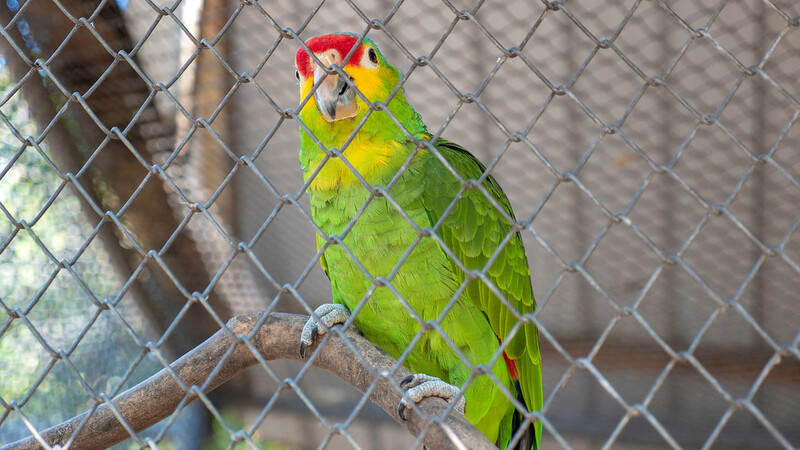 There was one macaw who lived in a large structure by himself. When I first started volunteering at ARCAS, this macaw was extremely timid. He was missing most of his feathers and wasn’t eating much of his food. Throughout my 10 days of volunteering in Guatemala, I witnessed huge changes in his demeanor and appearance. His bright red feathers started growing in, and he wasn’t quite as petrified when I entered his cage to feed him. One time, I looked over and he was dangling upside down, staring at me while eating bits of corn. I’m so proud that my volunteer work directly impacted these animals so positively. I also cared for a small pen of crocodiles, a small pen of turtles, two woodpeckers, a hawk, an owl, and a heron. With all of the animals, we’d scrub down their living quarters regularly, prepare their meals, and feed them up to three times daily. My sister, Robyn, who traveled with me, took care of howler monkeys, parrots, and a duck who she really loved. Others in our group cared for toucans (they’re more aggressive than I realized!) and other birds. 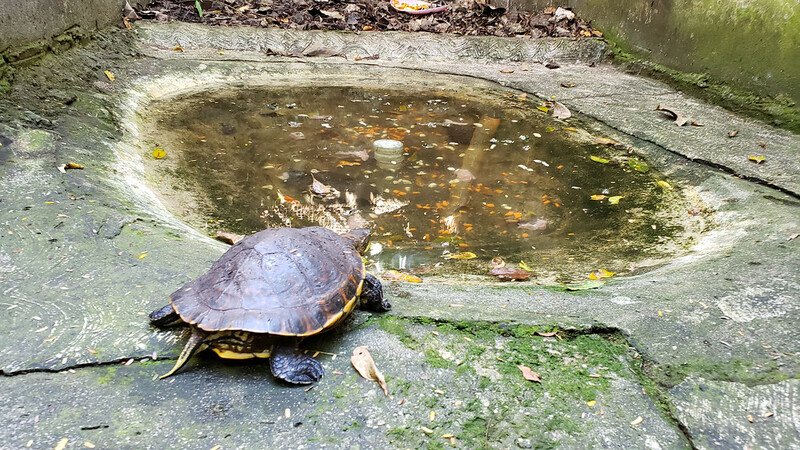 There are so many animals in Guatemala that wind up at ARCAS, but you’ll likely be caring for these animals throughout your stay. 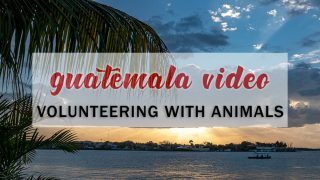 If you’d like to see a video about my experiences, check out my Guatemala travel vlog about this volunteer trip. When traveling to many other countries, there’s always some adjusting from your regular ways of life. We lived in comfortable, shared sleeping quarters. Our bathrooms had flush toilets (although the toilet paper must not be flushed) and cold showers. When you’re volunteering in Guatemala in February (and all year round), it’s going to be hot, hot, hot. You’re living in the middle of the jungle and it’s very hot, even in the shade. I was constantly dripping sweat, pretty much all day long, especially when I was working. While a cold shower seems pretty terrible, it actually wasn’t bad at all. It was really refreshing! There’s one main volunteer house where everyone stays. There are four bunk beds to a room, and two rooms share one bathroom. Depending on how many volunteers there are, you’re welcome to spread out throughout the rooms to have more space to yourself. We had three people to our room: myself, my sister, and another volunteer in our group with AEI. Surprisingly, it wasn’t all that bad sharing a bedroom and bathroom with these ladies. I shared our bathroom at one point with five other ladies (there were three staying in the other room that connected to ours), and it wasn’t too bad! 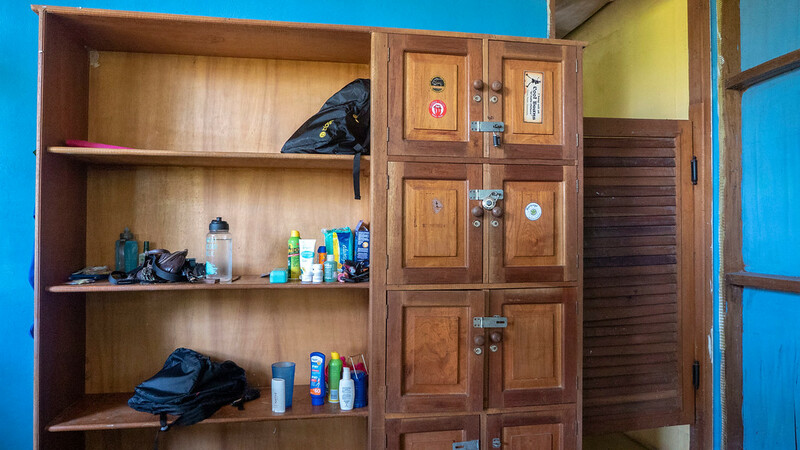 There are lots of shelves and lockers to store all of your belongings. Feel free to bring your own lock to lock away your valuables, like passports and wallets. I also recommend that you bring your own bug net (and lots of bug spray and sunscreen, naturally). Every room has its own fan, which cools down the room quite well. At night, I found that even got a little bit cold! 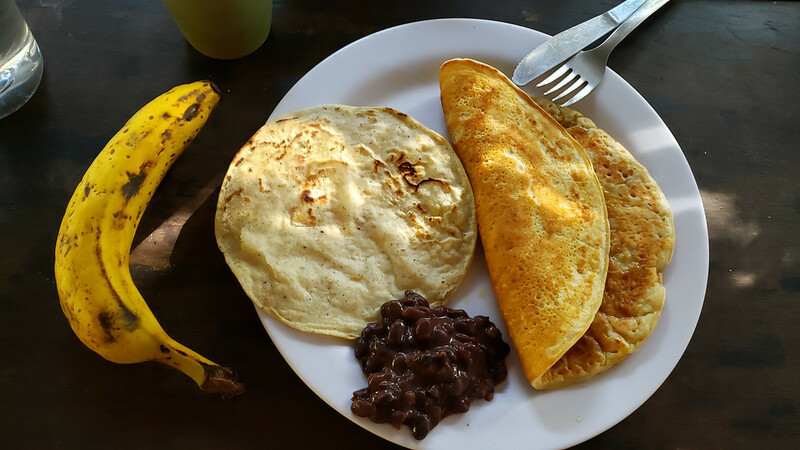 We had three meals a day at ARCAS, all cooked by a lovely Guatemalan lady. She didn’t speak any English (and I don’t speak any Spanish), so we mostly communicated in a few words here and there. She is an amazing cook and prepared delicious meals from very few ingredients. 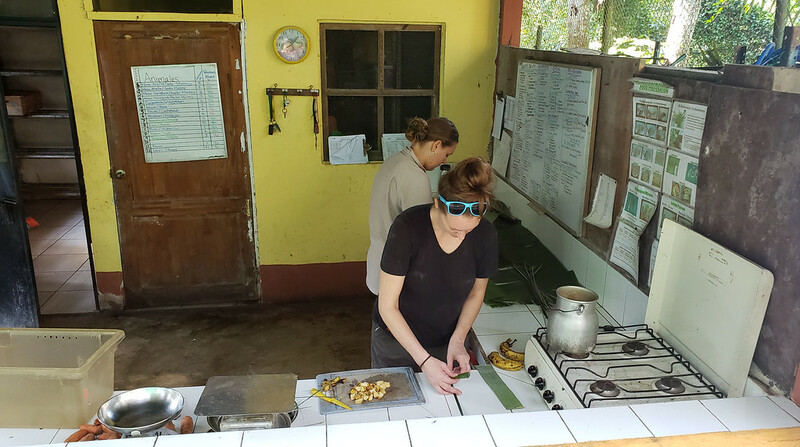 As the center operates on a very tight budget (helping the animals primarily), our meals mostly consisted of black beans, corn tortillas, potatoes, some fruit, and some vegetables. Most of the meals are vegetarian, with meat used sparingly here and there. It’s easy to request a vegetarian or vegan meal here. Within our group of volunteers, two of us were vegan and one was vegetarian. 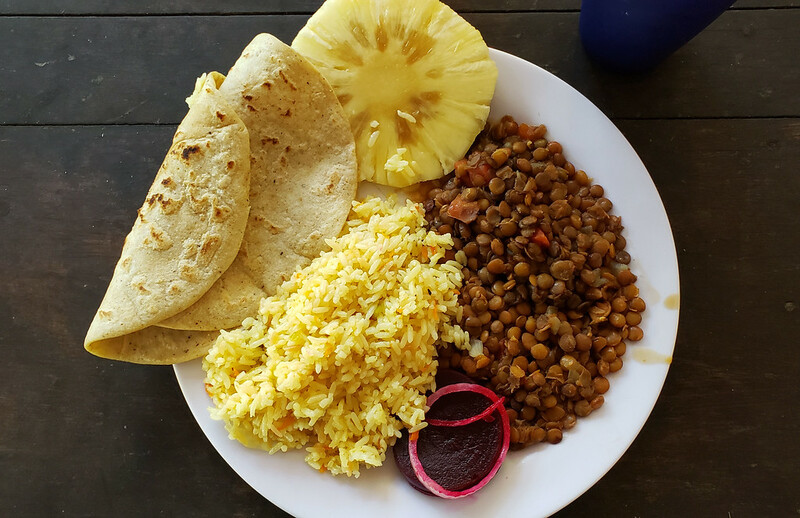 Naturally, many animal lovers and volunteers at ARCAS also happen to follow a vegetarian or vegan diet, so it’s no problem at all to make these meal requests in advance. Oh, and don’t drink the tap water while you’re in Guatemala. There was always lots of filtered water at ARCAS, so I recommend that you bring your own water bottle. Always bring filtered water back to your room for drinking and brushing your teeth. LifeStraw is also a wonderful product for removing bacteria and parasites from water. I’ve taken you around the volunteer house, the education center, and the rescue center. As for the rest of the property, there were a couple of spaces where we could relax and spend our free time. First, there were several hammocks placed around the volunteer house where you could gently sway and read a book. There was also a library with a large table and many fans, which was a great spot for group meetings and having some quiet time alone. I should also mention that there is no Wi-Fi on the property. 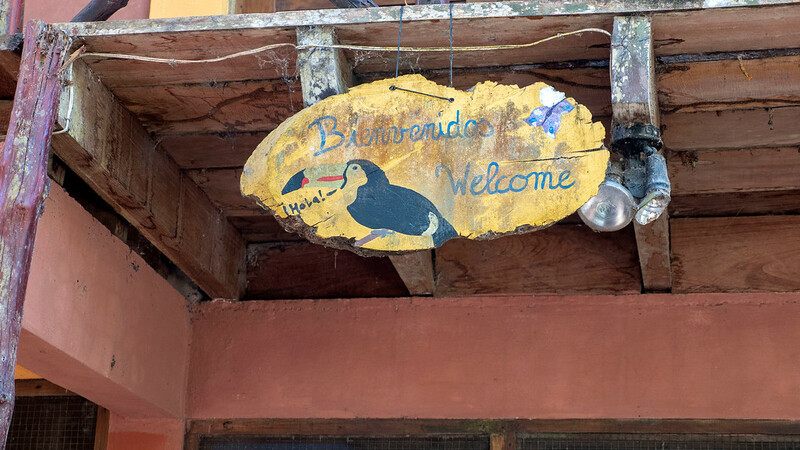 You can go into Flores to use an Internet cafe or feel free to purchase a SIM card as there are nearby cell towers. I used my KnowRoaming SIM card while in Guatemala, and I recommend you do the same. Down by the education center, there’s a huge dock where you can relax and even go for a swim. The water is so refreshing and the views are absolutely stunning. Be sure to go for a swim at least once while you’re there as it’s a great way to unwind and cool off. When you’re not helping animals in Guatemala (during your free time after 3:00pm), you’re welcome to use the hammocks or go for a swim. Furthermore, you’re welcome to take little trips for a few hours (or even for the day or overnight) while volunteering in Guatemala. The island of Flores is a short water taxi ride away, and it only takes about ten minutes by boat to get there. You can take the free boat that ARCAS owns over to Flores twice a week: on Mondays and Thursdays. Otherwise, you’re welcome to call your own water taxi and sail across for 20 Guatemalan quetzales one way (approximately $3, making the whole trip about $6). 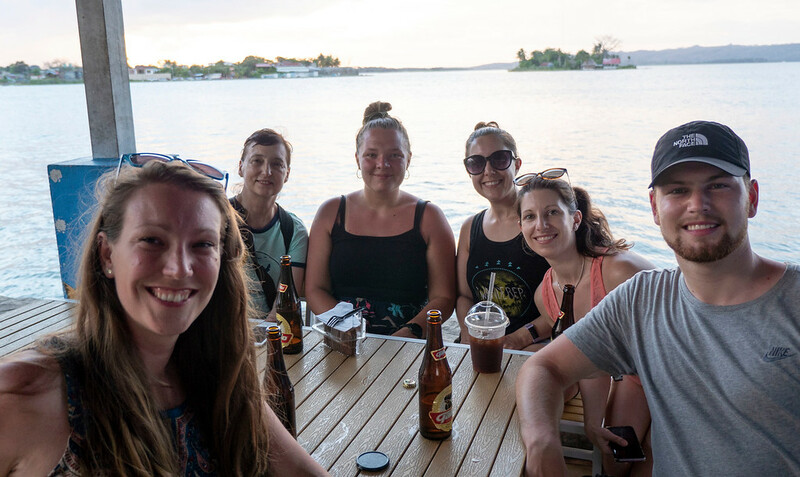 When we were in Flores, we made trips to the grocery store for snacks and whatever items we needed (for instance, I didn’t realize that I should have brought my own towel!). We also explored this adorable bohemian island at our own pace, wandering past its colorful homes. There’s a big church at the top/center of the island, and all of the circular streets lead up to it. Feel free to have a cold beverage, enjoying scenic waterfront views. Animal Experience International organized an overnight trip to Tikal for our group, which also included a sunrise hike at Tikal. I was absolutely amazed by this incredible site of ancient Mayan ruins. Tikal National Park is a UNESCO World Heritage Site and a significant center of Mayan culture and civilization. It’s easy to spend several hours wandering around this massive site to see all of the temples, plazas, and structures. Lying in the middle of the Guatemala jungle, this archaeological site was once one of the most powerful kingdoms of the ancient Maya. While some of its architecture dates back to the 4th century BC, most of the city’s structures were developed between 200 and 900 AD. Tikal declined in 900 AD and was completely abandoned around this time. It wasn’t until 1848 that Tikal was rediscovered and the ruins were gradually uncovered. 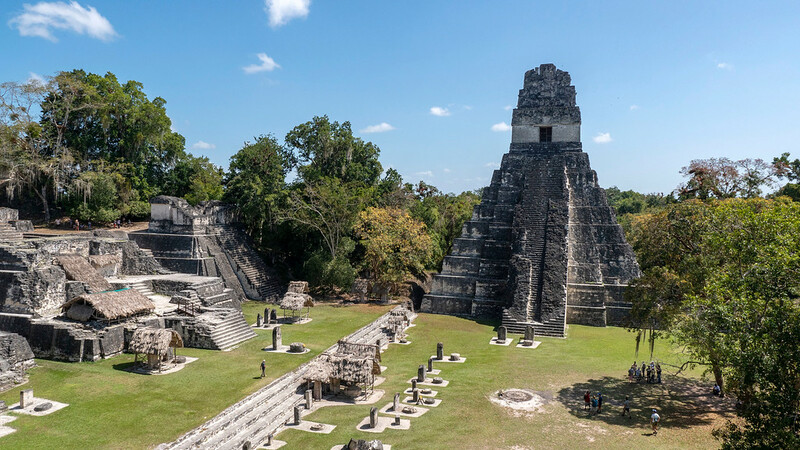 Only about 15% of the structures have been revealed, meaning that there’s still so much to explore and discover at Tikal. It’s common to see some sections covered in tarps because there are excavations always ongoing. We spent the night at the Tikal Inn, which was such a treat. I shared an adorable and posh hut with my sister (hot showers were such a luxury! ), and there was an amazing swimming pool. The meals at the restaurant were delicious, too. 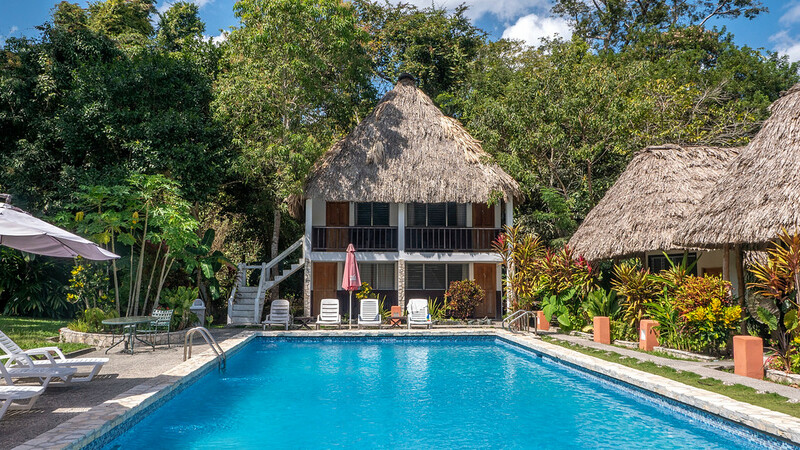 I highly recommend booking your stay at the Tikal Inn when you visit Tikal National Park. I highly recommend that you bring lots of water, sunscreen, bug spray, sunglasses, and a hat. It gets very warm there, and there are only a couple of areas where vendors sell cold beverages. If you want to beat the heat, book a sunrise hike. Your tour departs at 4:00am, but it’s a magical experience. Listen to the jungle animals wake up and watch the temples become more illuminated as the sun comes up. Then, explore Tikal with far fewer visitors this early in the morning. 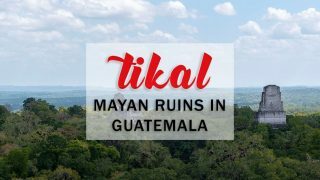 I’ve named Tikal as a destination you must see in your lifetime, so head straight to Guatemala as soon as you can. 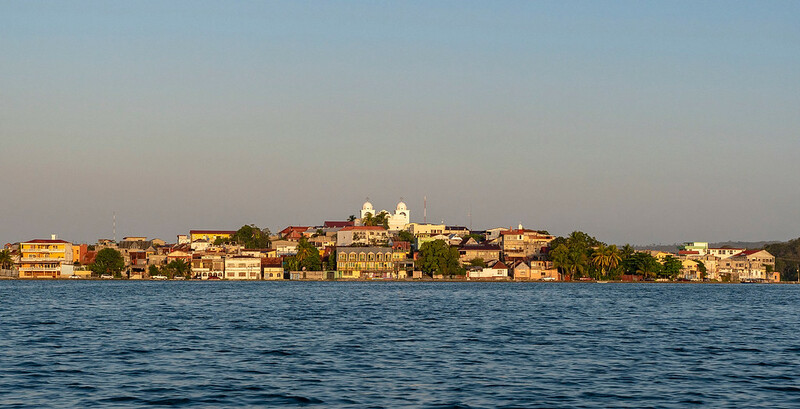 ARCAS Peten Guatemala is located across the water from the Flores airport. You’ll have to fly to Flores, mostly likely from Guatemala City or Belize City. My sister and I flew from Toronto to Atlanta and then from Atlanta to Guatemala City (with Delta Airlines). Then, we booked a separate flight from Guatemala City to Flores with Avianca Airlines. I’m sure that you’ll find the best combination of flights and layovers depending on where you’re coming from in the world. 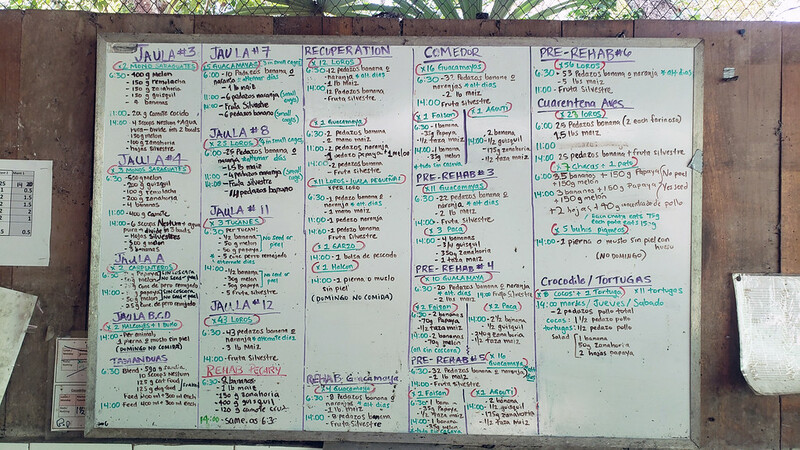 By the way, people from all over the world come to volunteer in Central America, helping animals in Guatemala. 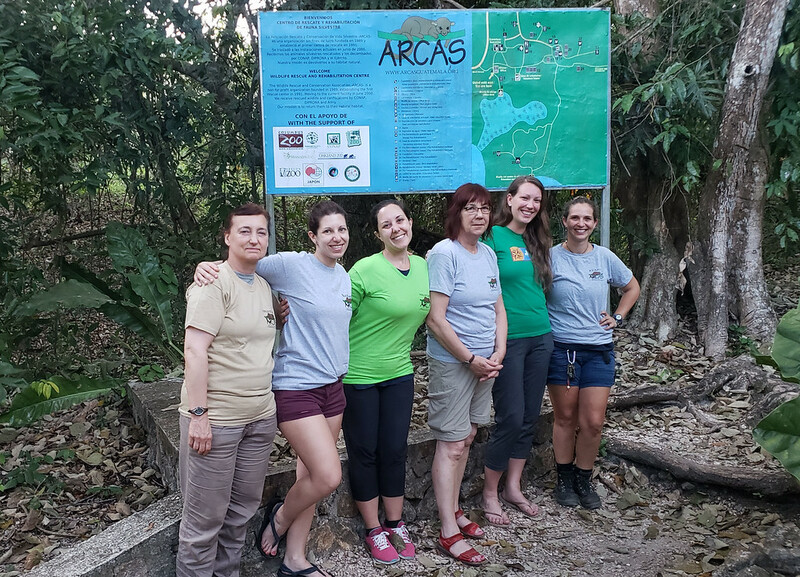 While we were at ARCAS Guatemala, there were volunteers from Denmark, Germany, France, and Canada. 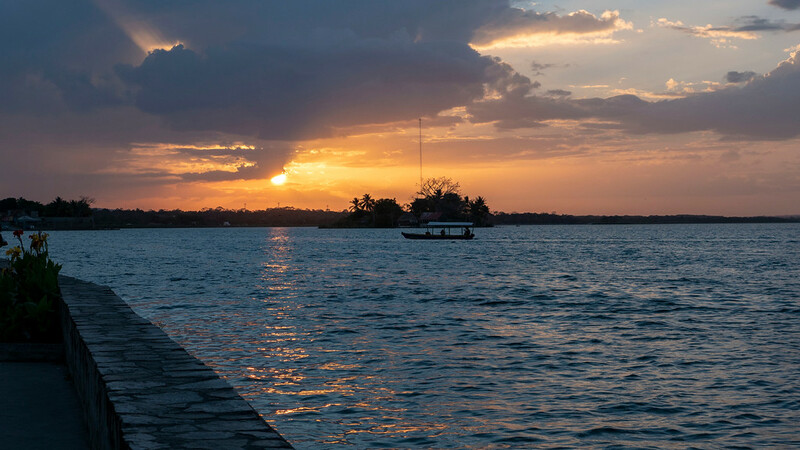 You can combine your journey to Guatemala with learning Spanish in Antigua, which will make it easier to communicate while you’re there. But, you can still volunteer at ARCAS if you only speak English, don’t worry! 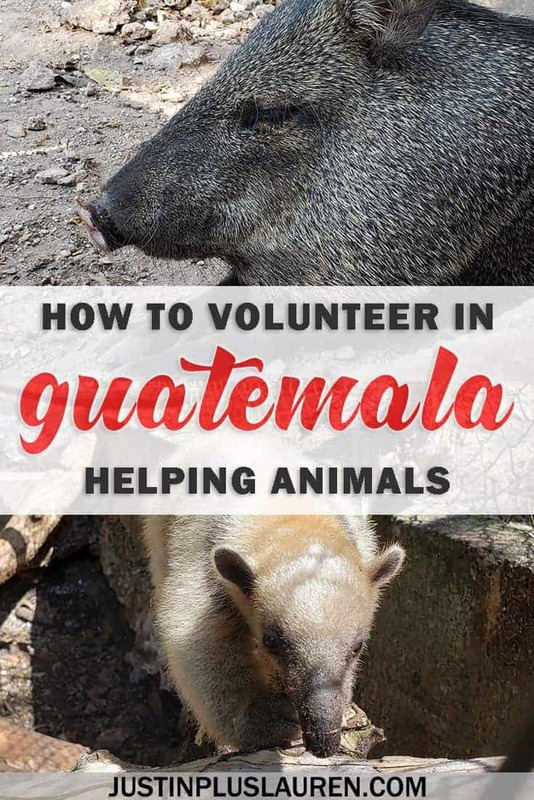 After volunteering with animals abroad, there are many ways that you can directly and indirectly help animals in Guatemala. I’ve come up with a list of things you can do to help, even in your own daily life. Volunteer helping animals in Guatemala or anywhere else in the world. One of the greatest experiences you can have is getting your hands dirty and putting in the time and effort. You don’t have to fly around the world, volunteering with animals abroad, to make a difference. You can help the animals in your own backyard, whether it’s at a shelter or a rescue center. Browse the Animal Experience International website to view their incredible, life changing trips. Consider making a donation to ARCAS. They’re a non-profit organization that relies completely on donations. Having lived at ARCAS for ten days and volunteered there first hand, I can see that they are quite frugal and don’t waste anything. Those at ARCAS spend money very wisely, and everything goes to the animals. Don’t buy wild animals as pets. This might go without saying, but a monkey is not a pet. A jaguar is not a pet. 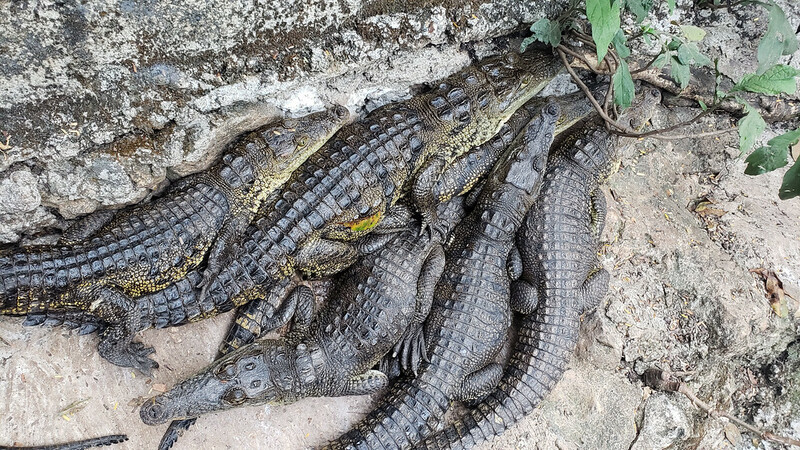 A crocodile is not a pet. And I might get a lot of flack for this, but a parrot is not a pet. These are wild animals and they belong in the wild. If you own one of these animals, it either came directly from the wild or it’s a descendant of a wild animal. 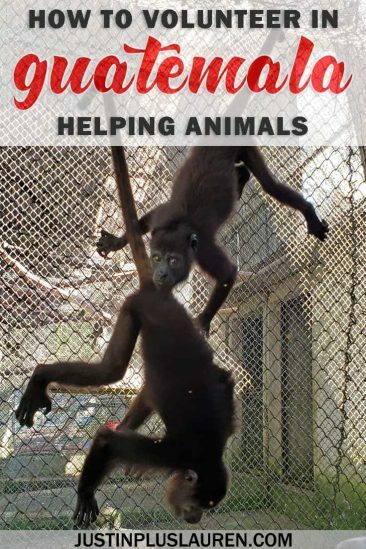 If you buy into this industry, the wildlife traffickers win, and the animals lose. So, if you must own a bird, please adopt one from a shelter that needs a forever home. Therefore, if you buy a bird from a breeder or a store, you’re adding to the demand for captive-bred birds. Check out all of my photos from Guatemala over at my travel photography album. You can purchase prints, canvas photos, housewares, phone cases, and more – all created out of our photography! Just click “buy” on any of the photos. Easy peasy! If you have any questions, please let me know as I’m here to help. I’d love to help you volunteer in Central America or go volunteering in Guatemala with the goal of working on wildlife conservation projects. Volunteering with animals abroad is such a rewarding, hands on experience that really does make a difference. It’s the perfect way to combine your love for animals and your love for travel. I highly recommend volunteering to help animals in Guatemala, as it was one of my most valuable travel experiences I’ll always cherish. 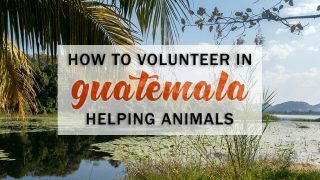 Do you have any questions about my experiences helping animals in Guatemala? Please let me know in the comments! I loved Guatemala when I visited a few years ago. Sadly I never did any volunteering in this beautiful country, but I hope to go back there one day so maybe then! Your post brings back lots of fond memories! Gemma, that’s awesome! It would be really awesome if you were able to go back and help out at ARCAS. I’m glad that I brought back some great memories for you! It’s such a beautiful country. I’m really itching to see more of it now! 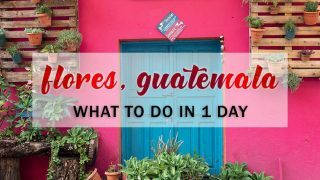 I don’t know much about Guatemala but after reading your post, I love the idea of volunteering there. I like to volunteer with wildlife abroad each year so will keep this place in mind for future. It looks like they do great and important work! Tasha, it’s a wonderful place that does so much good in the world. If you like to volunteer with wildlife and animals and do these kinds of trips, I feel like you’d really love it there! They really put the animals first here and I totally stand behind what they do! Aren’t the howler monkeys amazing? I was so impressed by how loud they are! Wowza. I hope that you get to do a trip like this, it’s a life changing experience!